Four years ago in May 2009, the Sri Lankan military routed the Liberation Tamil Tigers of Eelam (LTTE), destroyed its leadership and secured control of Tamil dominated areas in the country’s north. Sri Lanka is lauded as the first country to eradicate terrorism on its own soil, but the 2009 victory came at significant human cost. An estimated 300,000 people were displaced. According to the U.N., some 40,000 civilians were killed in the first five months of 2009. 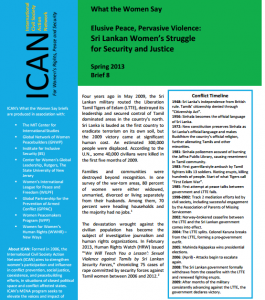 This brief focuses on women in Sri Lanka’s northern provinces in the aftermath of war. Drawing on a survey conducted in ten war-torn districts and discussions with over 450 women, it reflects on women’s legal gains and their activism for peace and human rights while also highlighting the critical security, economic and social risks that many women face.4 The recommendations we offer to the Sri Lankan government and the international community reflect the survey findings and priorities outlined in the 2012 Sri Lankan Women’s Agenda on Peace, Security and Development.